July on Foggy peak, looking south-west towards Mt Cook and Mt Tasman (distant horizon, centre-left). Several ski fields operate in the basins on the 2000m Cragieburn range on the right. A limestone basin separates the Torlesse and Cragieburn Ranges. From Porter's Pass, Foggy peak is a short 800m climb. Porter's Pass is the highest point on the West Coast road (next is Arthur's Pass). Foggy peak sits at the Southern end of the ~2000m Torlesse Range - only 40-45min from Christchurch. The ridge is broad and wide and can offer good skiing. It narrows after Castle Hill Peak (1999m) and a large notch in the ridge forms a well known landmark - the Torlesse Gap. 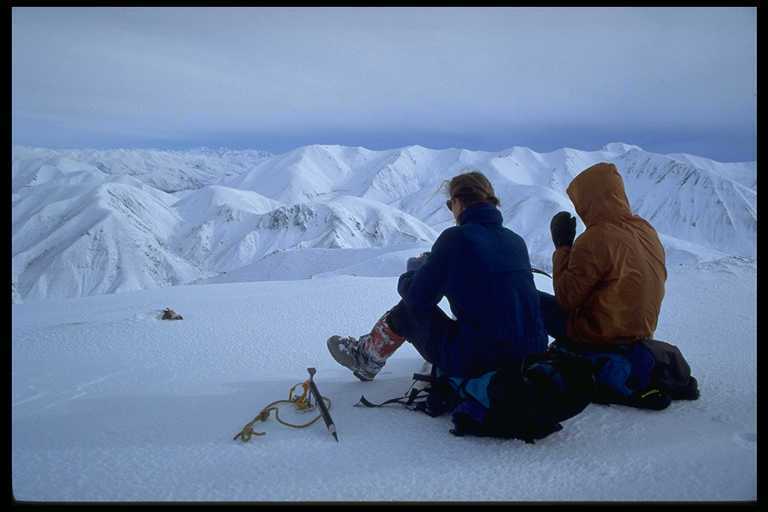 The Torlesse range can offer stunning views of the Canterbury Plains and many a good day walk in summer and winter. However, the vast amount of scree and common Norwest gales can make these hills hard work. An easily accessible hut at the base of Mt Torlesse is worth a visit when time, weather and laziness do not permit an excursion farther afield... its a good place for a picnic or a party. The South face of Mt Torlesse can retain snow as late as November. The 1000m vertical drop from the summit via a scree slope can provide excellent bumslides - or an awesome ski run - unfortunately there is a 1500m climb up and a little waterfall to negotiate at the bottom. Watch out for avalanche conditions before sliding!